Lady Bunny Blog: GREAT ARTICLE! I'm glad that some people were comforted by Obama's heartening words on Trayvon Martin. It really is touching when a murderer of at least 176 innocent kids can take the time to mourn one death. It doesn't make any sense to take comfort from a murderer like our president speaking about the unfairness of a slain kid, but sense and connecting the dots aren't cornerstones of the Obama administration. Making stirring speeches which mean very little is. So we have to connect the dots for him and for our pitiful news media. 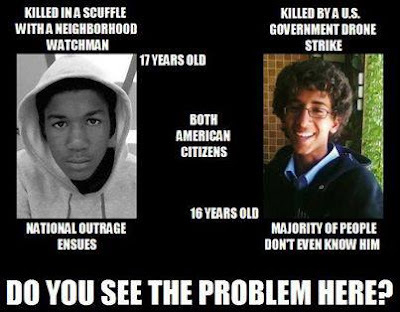 If killing innocent kids like Trayvon is so wrong, then stop doing it yourself, Obama! Oh, but we don't like to think about those racially/religiously profiled kids in other countries because that's a little too tough for us to digest. Then we'd have to address our hatred of muslims and the fact that our tax dollars buy Obama drones to kill those innocent kids and thousands of adults.